When for whatever reason you may no longer be much of a walker, that shouldn’t be a reason not to be a birder. A car is the obvious solution. When it’s sunny, you have the shade you want; when it’s cold, you can turn on the heating; when it’s windy, you can close the windward window. And you can also use your car speakers to play that owl call. What sort of a car would be the best choice? I drive a low clearance car and see that as the main obstacle, hence, from my point of view, a high clearance crossover or SUV would do just fine. Diff lock would be an advantage, too, but despite the obvious “choose some 4×4” advice, in most situations a thoroughbred 4×4 is not necessary. If you are a careful driver, that is. I remember the situation where my colleague and I were driving the same company’s 4×4 along the same stretch of a sticky-mud dirt track (I almost used the word “road”). I knew how I’d feel if I got stuck – like a turtle on its back, so I was very careful and equally successful not to get stuck. My colleague is a more aggressive driver and he had to call the local farmer for tractor assistance more than once. A car also doubles as a good hide – many species will not respond to it (from personal experience, not just birds, but otters too). They are especially suitable for open terrains and larger birds. A car also allows you to cover a larger area and a wider cross-section of habitats in the same day. Whenever possible, plan your route so the sun is behind you most of the time (e.g. head west in the morning and back east in the afternoon). Avoid the main roads, birds tend to avoid them, too, and opt for local roads, preferably those with electricity pylons along them (many birds rest on the wires). Drive slowly, ideally 30 to 40 km/h (20 to 25 mi/h), and ignore the honking lunatics overtaking you. Stop the car before or after the spotted bird, not next to it because it would take flight. Always stop by the side of the road, never on the road itself, and develop the habit of turning on all four indicators immediately. 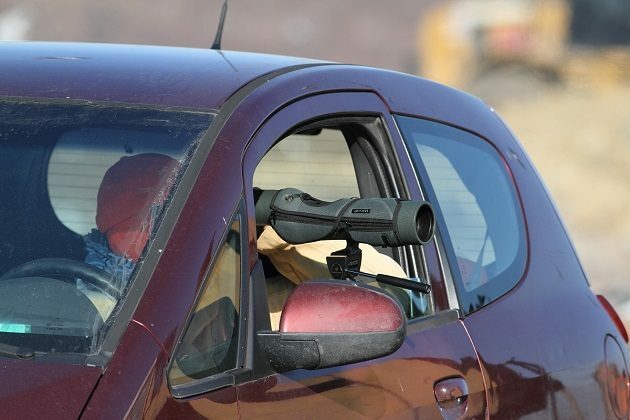 Drive with your windows open (yes, even in freezing temperatures), it will make the use of binoculars easier, not to mention that way you can hear birds when you do not see them. Even when you don’t see any bird, stop by good habitat stretches, look and listen, especially by water bodies, bridges, gulches, boulders, etc. Try to think like a bird, ask yourself “if I were a [whatever bird is likely], would I choose this spot?” Sounds stupid, but repeated over time, you will actually learn where to expect birds and where not to expect any bird but a crow. 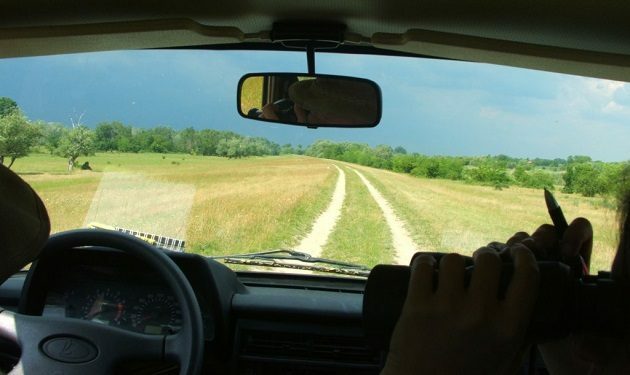 There is one more advantage offered by a car: skip the tripod and scope the area using the window clump mount (above). That way, the scope is mounted at one of the open windows and is beyond reach to anyone but the person in the seat next to it. There is a way around – use the digiscoping adapter to show the bird to your friends on the screen of your phone. Finally, don’t forget coffee and, in hot weather, water, and in cold weather, a flask of some firewater. Yet, if you are the driver, you should carry the flask only to offer to your friends and not for yourself. You have heard it a million times, but it remains true nevertheless: safe driving comes first. PS. I know that I learned some of these tips from some South African book that I read 19 years ago when I lived there. I do not have it and do not remember the title, I only remember them well because they were of utmost importance to me. Perhaps South African readers would know the title? 3. And as a consequence, be proficient in changing tyres….